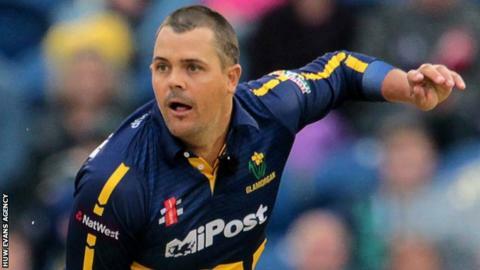 Glamorgan captain Jacques Rudolph leads a familiar-looking squad for the opening 50-over friendly against Gloucestershire in Cardiff on Friday. Glamorgan include young fast bowlers Jack Murphy and Ruaidhri Smith, who missed most of last season through injuries and university commitments. But new recruit, Netherlands paceman Timm van der Gugten, is not yet considered after the T20 World Cup. Glamorgan will be allowed to use all 13 players during the 50-over match. With batsman Nick Selman having to wait for his chance, there are no new recruits in the Welsh county's opening line-up. South African batsman Colin Ingram and Australian fast bowler Michael Hogan will join the squad closer to the official season, after playing first-class cricket in their native countries during the UK winter. Aneurin Donald, James Kettleborough and Andrew Salter have been playing club cricket in Australia. Donald, 19, was part of the Darren Lehmann Academy training programme in Adelaide, and also played two games for England Under-19 in the World Cup in Bangladesh. He hit the headlines for a bizarre overhead scoop shot boundary, which went almost directly behind the wicket-keeper. "I think it just took off and everyone got round it on social media, it was nice to do something memorable though I would like to have been remembered for more runs," he told BBC Wales Sport. "It just happened, I got in an interesting position and really got hold of it. If I ever play it again, I'll come up with a name for it." He is hoping for a more regular place in the first team after having to fit in his A levels in 2015. "If you get a chance in pre-season you have to try to nail it and get yourself a bit of form, spend a bit of time in the middle and get in the team for the first (official) game of the season. "I'm very confident (of playing more), but it's down to me getting the runs and my first target is ticking off the first first-class hundred (after hitting 98 last September). "Then it's becoming a first-team regular and contributing in all formats." Glamorgan's build-up to the competitive season also includes a one-day friendly against Cardiff MCCU, a three-day match against Somerset and a first-class match against the students, all at the SSE Swalec Stadium. They start their championship campaign against Leicestershire at home on 17 April. Glamorgan squad v Glos: J Rudolph (capt), J Kettleborough, W Bragg, A Donald, C Cooke, D Lloyd, G Wagg, C Meschede, M Wallace, A Salter, R Smith, J Murphy, D Cosker.